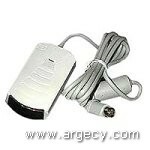 The infrared adapter provides a wireless I/R connection at up to 4 megabit per second (mbps). A high-speed infrared device that eliminates switch boxes or cables needed for printing or transferring files between an infrared portable computer and a desktop PC or printer. The capabilities of the MarkNet IR satisfy a need of the increasing number of workers who use a laptop, PalmPilot, PDA, or notebook computer while on the road, but switch to a desktop PC or printer at their home or office. The MarkNet IR can be connected to either a desktop PC or printer or it can be connected to both and pass through print jobs when the infrared feature is not in use. If the user switches to the infrared portable PC, the MarkNet IR will automatically direct data to the desktop PC or printer.